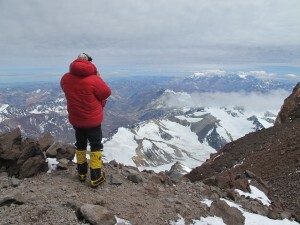 On the roof of South America @ 6962m! 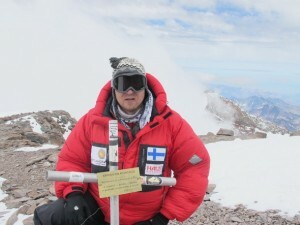 At 12.20hrs (Mendoza, Argentina time), Atte & Luco are standing on the summit of Cerro Aconcgaua – just the 2 of them!!! It’s been a long, tough day for the guys. 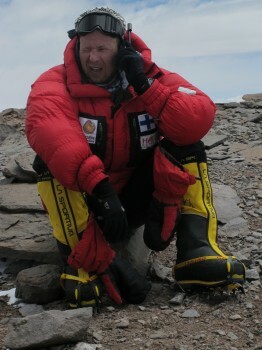 They’ve been climbing for the last 7 hours – the longest day Atte has spent climbing since the start of his expedition. Latest plan was to stay at Camp Cholera and go for the summit on Tuesday 27th December however the weather gods opened up a brief window and the guys took advantage of it and started climbing today. 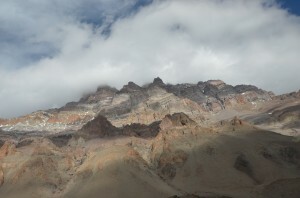 The weather has been relatively kind today but the clouds are showing that snow is coming shortly so after a short break at the top to refuel their bodies, take pics and soak in their amazing achievement (Atte’s 1st summit of Aconcagua & Luco’s 17th!!!) they will be heading down as they are only half done. The plan now is to return to Camp Cholera (6000m) before it starts snowing and stay there overnight and tomorrow pack the camp and head down to Plaza de Mulas Base Camp (4350m) before heading out of the National Park and back to Mendoza for a midday flight back to Santiago, Chile on the 28th. 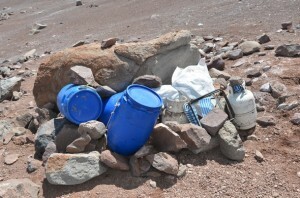 Atte & Luco take the advise of the other group and return to Camp Cholera (about 6000m) and wait for the weather to clear. Atte & Luco have made it up to Camp Cholera in a little over a couple of hours. Atte’s throat is no better since a few days back and so today he has started to take Zithromax, an antibiotic to help clear the infection. 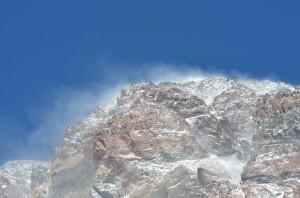 The winds were still apparent and not letting up. There was a number of times both guys (weighing over 100 kilos including their backpacks) were being lifted off the ground as they walked up towards the higher camp. They are to spend tonight at Camp Cholera. If the weather report comes back satisfactory, they are to push for the summit tomorrow morning however, if the weather condition remains the same as today or is worse then the boys plan to spend the day at Camp Cholera and delay the summit bid. Atte wishes you ALL a very merry and safe Christmas with loved ones!!! Atte & Luco leave behind the Grajales team at Plaza de Mulas base camp and head up the mountain straight to high camp 2 ~ Nido de Condores. 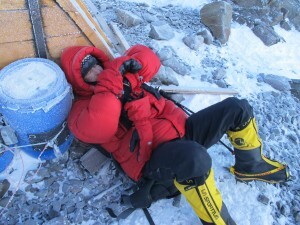 They reach the camp in a little over 4 hours, happy but tired after climbing up over 1200m in altitude. The wind was a little calmer than it has been lately however every now and again there were gusts of wind that almost blew the boys off their feet! 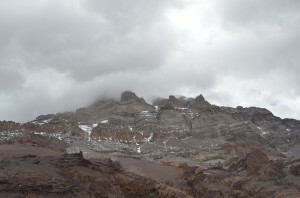 Nido de Conderes camp is in an exposed plateau so tomorrow the plan is to continue heading up the mountain bypassing Camp Berlin and going to the final high camp ~ Camp Cholera at about 6000m. 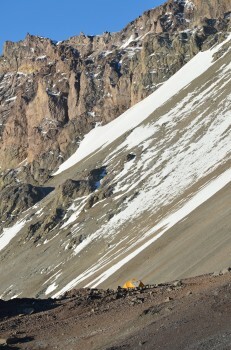 This camp offers better protection from the wind and is also closer to the summit. 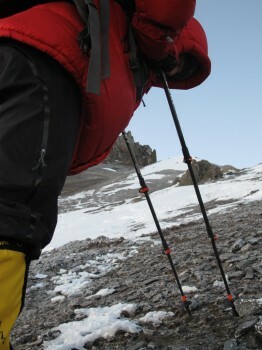 The weather forecast has stayed consistent, so we’re starting our second push for the summit tomorrow morning. 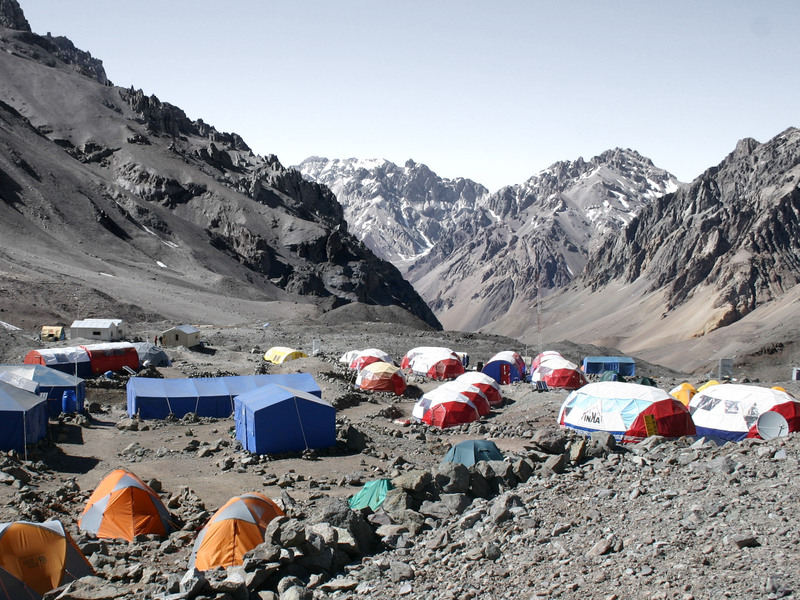 Our plan is to move straight to Nido de Condores, the second of our three high camps 1200 vertical meters above Plaza de Mulas and after sleeping the night there push onwards to the last high camp, Cholera, located at 6000 metres. 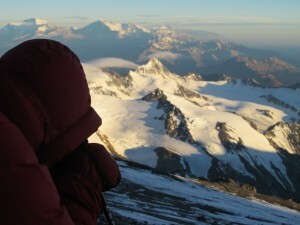 We expect to spend Christmas Eve at Cholera, named after climbers “going crazy” as a result of the high altitude – not the water-borne disease. On Christmas Day, December 25th, we expect to make our push for the summit. From Cholera we still have almost 1000 vertical meters to cover, which will probably take about eight hours, even in good weather. We expect at least 50 km/hour winds at the summit, so the next few days may not be very enjoyable, but we’ve agreed with Luco that we can stand a bit of pain to reach our goal! I won’t have internet access from here onwards, so Delanii will be updating this blog based on our sat phone calls. It was good to wake up at Plaza de Mulas this morning – the heavy winds at base camp highlight that a storm is brewing close. Kicked off my morning with the first of the mystery pills prescribed by the base camp doctor and hope it, along with breathing steam from a hot bucket of water spiced up with salt and chamomile will fix whatever the problem is in my throat! Spent most of the day chatting with Grajales staff as well as members of a Jagged Globe expedition, also at the Grajales camp. The climber we helped out yesterday came to thank us for bringing him down and to say he was glad not to be up on the high camp anymore. Also met one of the local guides leading an Indonesian team that wanted to film a documentary for a local TV channel, which we had met before in Confluencia. The team had made a summit bid yesterday, failed and will be heading home tomorrow unsuccessful. 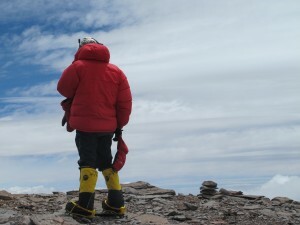 All the members of the Indonesian team are experienced mountaineers, so this is a great example of the fact that weather is unpredictable and experience alone doesn’t guarantee success on Aconcagua – the park hands out approx. 3000 permits to climb the moutain each year and only 30-40% return home successful. We started our morning by descending approx. 1300m down to Plaza de Mulas base camp. At Plaza Canada, met a group from another company who request us to bring one of their climbers down to Plaza de Mulas – helped out, but descent took forever! Tomorrow was our initial planned summit day, but weather reports now forecast 135km/h winds, which makes climbing impossible. Our revised plan is now to wait here for three days for most of the storm front bringing strong winds to pass over, climb back to Nido de Condores, the second of our high camps on the 23rd, continue to our last high camp, Cholera on the 24th and push for the summit on the 25th. Of course, assuming the weather doesn’t change again. 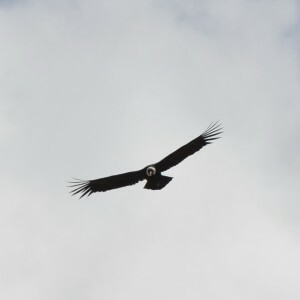 Hanging out with the Grajales staff at Plaza de Mulas, a huge condor circled the camp for several minutes, probably looking for “dead” climbers and I got some great shots of it with my Nikon. Will upload the pics as soon as back with faster internet access. In the evening, saw the doctors at Plaza de Mulas for my thoat, which has been getting consistently worse over the past days. Got some pills but no infection! The doc’s also did a general check and my pulse ox was 90 – so well acclimatized for now! Trekked up from Plaza Canada, first of our three high camps, to Nido de Condores (5575m), which means nest of the condors (top of the foodchain on the mountain) this morning, which took us about three hours, but felt like a lot longer, because of the reducing amount of oxygen in the air. Got our tent up just in time before a surprise snowstorm arrived, bringing about 40cm of snow. Some of our friends working as porters on the mountain got caught out in the bad weather, so we gave them shelter and food for a couple of hours. None of the weather forecasts had expected the storm so we used the sat phone to get a new weather forecast which looks pretty bad for the next several days, so made decision to return to Plaza de Mulas tomorrow morning to wait for a weather window that would allow us to head for the summit. After breakfast Luca & Atte, the 2 man show leave Plaza de Mulas base camp for the next 4 days and return to Camp Canada at 5050m. 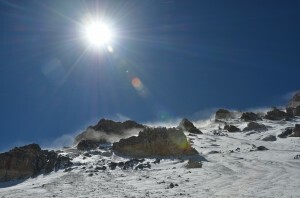 The weather has been good – sunny sky but the wind is heavier at the new higher camp. On arriving at Camp Canada, the guys run into a problem and discover there aren’t enough tent poles to pitch the tent! There was no going back to base camp so with lateral thinking the tent got pitched. There is no other tent at Camp Canada. The 2 closest tents were pitched 200m higher up so the rest of the day was spent Atte fetching water, Luco cooking, the boys chilling, learning / teaching Spanish / English and getting acclimatised. Our day seemed to follow yesterday – we bid goodbye to the Moutain Trip team and picked up our backpacks and headed up the mountain. We need quite a bit of gear and food, so we need to do a load carry i.e. carry about half of our gear to the high camp, return down and carry the rest the next day when we move and actually establish the camp. 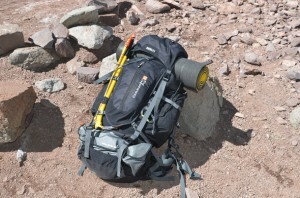 Thanks to our acclimatization yesterday, we moved quickly despite the 15-20kg backpacks and reached Plaza Canada in just 2.5 hours, established a gear cache and headed down. We came down porter-style which means fast. It took us just 40-45 minutes to reach Plaza de Mulas and even I was pretty impressed with our speed…until Luco pointed out that he comes down in 8-12 mins if he’s alone!